Your boat's position is 30 degrees, 00 minutes 00 seconds North latitude and 88 degrees 14 minutes 38 seconds West longitude. The nearest Standard Meridian--the center of a time zone--is 90 degrees West longitude. Since the Earth turns to the East, you'll see sunrise at your location a few minutes before people in New Orleans, which is located at 90 degrees West, directly on the Standard Meridian. By calculating the correction factor, you can determine the exact time of sunrise at your location. 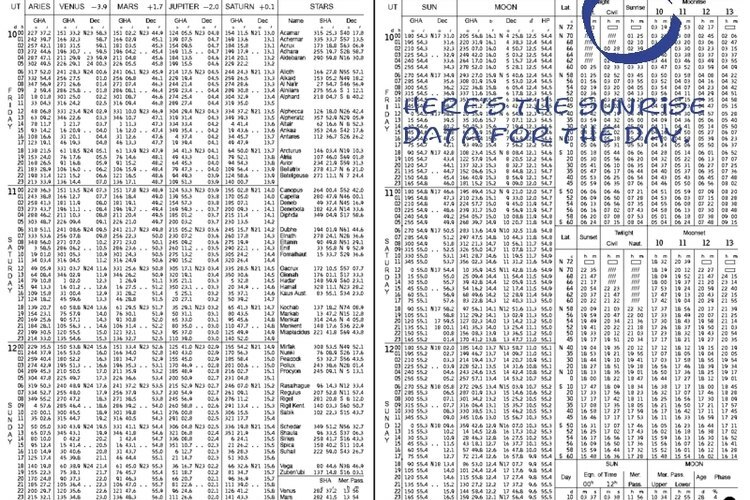 Find the page in the Nautical Almanac for the date for which you want to determine sunrise. In the "Sunrise" table, find your latitude and note the time of sunrise for your latitude. This is the time that sunrise will occur at the Standard Meridian at your latitude and the time to which a correction factor will be applied. Convert the minutes and seconds of your longitude to their decimal equivalents. Divide the minutes (14) by 60 (the number of minutes in a degree); the result is 0.233. Divide the seconds (38) by 3,600 (the number of seconds in a degree); the result is 0.0105. Add the decimal equivalents of minutes and seconds to the degrees. The result is 88.2438 degrees West longitude. Calculate your correction factor. The planet is divided into 24 time zones, each 15 degrees wide and each degree equals 1/15 (0.667) of an hour. Therefore, if you multiply 1.7562 by 0.667, this converts your Difference of Longitude into a decimal portion of an hour. Multiply this decimal part of an hour by 60 to determine how many minutes of correction is to be applied. The result is 7.0283, the correction factor. Apply the correction factor. If you are east of the nearest Standard Meridian, subtract the correction factor from the Zone Time. If you are west of the nearest Standard Meridian, add the correction factor to Zone Time. Navigators call this result the Local Mean Time.